The Northern Ireland Football League has launched a consultation process which will take in all 42 member clubs and other key stakeholders. The process is being undertaken with a view to plotting the future shape of domestic football in the country. Uefa will facilitate focus groups and assist the NIFL in converting its vision into tangible results. The NIFL will present their findings regarding future structures and a roadmap towards implementation in May. The body launched their Vision 'Creating Our Football Future Together' strategy at a meeting in Belfast on Wednesday night. The Vision outlines projects and targets for the future development of the domestic game in Northern Ireland. The NIFL, in conjunction with Uefa, are to undertake two comprehensive research projects focussing on the future structure of the leagues and competitions, as well as the rebranding of the Northern Ireland Football League. The focus groups for all the member clubs will commence on Monday, while in January the Project Steering Group will oversee further focus group meetings with other stakeholders, including fans, sponsors and the media and broadcasters. The general public will also be afforded to articulate their opinions by means of independent research conducted on behalf of the NIFL. The Project Steering Group will present the results from this research in March 2014, with a view to achieving consensus about the preferred re-structure options for the NI Football League. In April 2014 the Project Steering Group will determine the future structure of the leagues and competitions based on the analysis results and feedback from the focus groups. 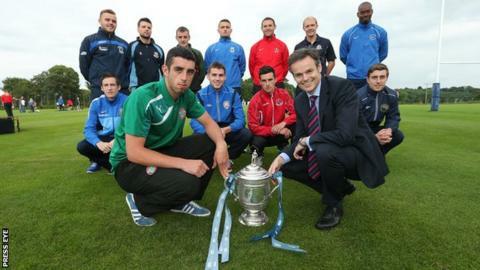 The NI Football League will communicate the future structure of the leagues and competitions in May 2014, and present a roadmap towards its implementation. "The launch of this Vision document is an important milestone for the NI Football League," commented NIFL Managing Director Andrew Johnston. "The document is a statement of intent and the UEFA research projects are arguably one of the most comprehensive and important projects that will have been carried out on domestic football in Northern Ireland. "From looking at the league and competition structures, to increasing attendances and commercial revenue, there are six important targets that we aim to meet in the next few seasons. "The NI Football League is aiming to create a new football future in Northern Ireland and every stakeholder will have the opportunity to be involved." The initiative is being undertaken against a backdrop of falling attendances and a lack of sponsorship in the Irish League over recent years.